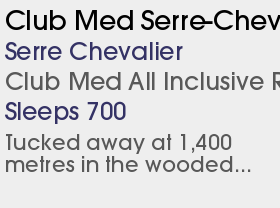 WEsay Attractive tree lined slopes and varied off piste available in this big ski area. Pretty old villages each with their own charm. 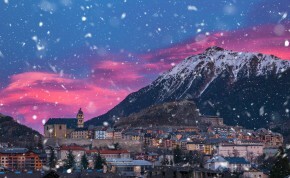 Set in the Southern Alps, Serre Chevalier is divided into a dozen villages that share a large ski area with the ancient garrison town of Briancon. The attraction of this resort is often underrated. It has more piste than La Plagne, more lifts than Les Deux Alpes, more vertical than Avoriaz, yet never seems to attract the same crowds. All levels of ability are well-provided for and the lift system continues to improve. 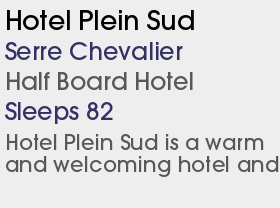 It is considered one of the most friendly resorts in France for snowboarders. There are two good snowparks and linked runs stretching for more than 19km down the southern side of the valley that test even the most advanced riders. In contrast to its neighbours Les Deux Alpes and Alpe d’Huez, Serre Chevalier’s nightlife is more refined. However, there is a nice spread of bars in Villeneuve and even the occasional disco, all of which liven up notably at the weekend. Day time off-piste is similarly quiet but there are some areas of historical interest and a smart, fully-equipped sports centre. And after a hard day on the slopes why not unwind in the thermal baths at le Monetier and take in the view? 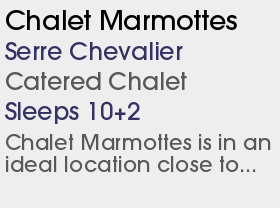 The slow Rocher Blanc chairlifit and adjacent Serre Blanc draglift at the top of the Briançon sector will be changed for a new quad chair that can transport 2,300 people per hour. 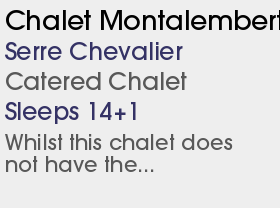 This will speed up the connection to the Chantemerle sector. You’ll be able to give Mountain Karting a go on a three-wheeled kart with snow tyres. And another toboggan run will open during the February and March French school holidays 4km long, 573m vertical, 26 turns through the larch forest.